Security, with regards to records management, can take on distinct functions: protection against theft of data and protection against outside forces, such as fire. Your records and the sensitive information that they contain should be shielded from prying eyes, even if those eyes might be your own employees. 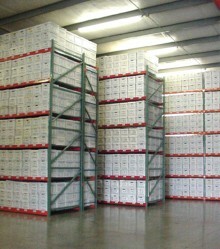 If your records are stored in your basement or in your office somewhere, who currently has access to those records? Are they locked when not being accessed? Health information and financial information are particularly vulnerable in today's climate of identity theft and heightened need for privacy. In 1996, the health industry changed significantly with the passing of the Health Insurance Portability and Accountability Act (HIPAA). With this act, a patient's information and right to privacy increased substantially, thus increasing healthcare provider's responsibility to protect that privacy. Guidelines for compliance with HIPAA change regularly, but it essentially means an increased level of security on sensitive information is needed. Having your records in a secure, off-site environment that limits access to only those that are authorized becomes a crucial factor in your records management decisions. In addition to security of access to individual files and records, security on the location of those records is equally important. Access to our building is restricted throughout the day. To get in our doors, you must have a code to enter the building or be buzzed in by our receptionist. At night, our alarm system is connected to a monitoring system that will alert the police or fire department should any issue arise. Another key security feature on our location is fire protection. Many people who view and tour our records center ask about sprinkler systems. The answer to that question is easy: we do not have sprinklers. For a records center, versus other types of businesses, a sprinkler system is actually just as hazardous to the contents of our facility as a fire would be, and in some cases more. If a fire is isolated, the sprinkler system could easy destroy records outside of the fire's area which would have been safe otherwise. Instead of sprinklers, Records Management Services employs a fire detection system that is connected into our alarm system. Monitored 24 hours a day, including during business operation hours, smoke detectors located throughout the building will alert the monitoring service of any potential issue. The fire department will be called to come and check the building, even if no fire is readily apparent. In addition, our records center is separated from the rest of our building by a fireproof wall. Should a fire occur in the front of our building, the records center would be sealed off from the fire in order to protect our customer's records. Are you sure of the security of your records where they are now? We would be happy to give you a tour of our secure facility and show you the security measures we have in place.